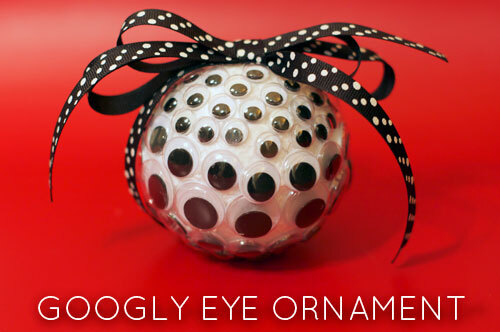 I wanted to create an ornament that captured my sense of silliness and fun. Nothing says that more than googly eyes! I’m a big googly eye girl (if you’ve seen my googly eye Halloween creations, you’ll see why). Anyway, I know this project won’t be for everyone, but for those with kitsch and quirk in our hearts, it’s the perfect funny holiday accent to add to the tinsel tree! 1. Rip up little strips of tissue paper and glue onto the ball. I was fortunate enough to have the one and only Mr. Tacky Glue to help me! Swoon! I do this so the pourous parts of the ball don’t pop up through the googly eyes. I think that’s kinda ugly and the tissue paper gives it a smoother finish. Thanks Pattiewack for this tip! 2. 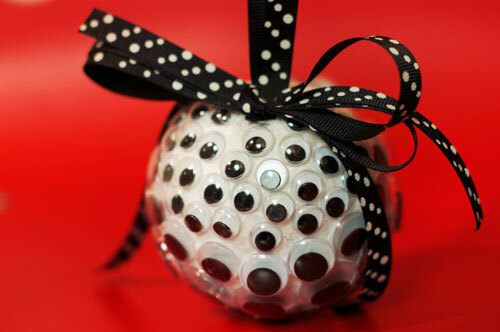 Around the center of the ball, line the larger eyes. Do a smaller size googly eye above and below the large eyes. Then finish up the top and bottom with the smallest-sized eyes. 3. Tie with a double bow for the top. Pin in place. Add a loop ribbon for hanging if desired. So how about you? 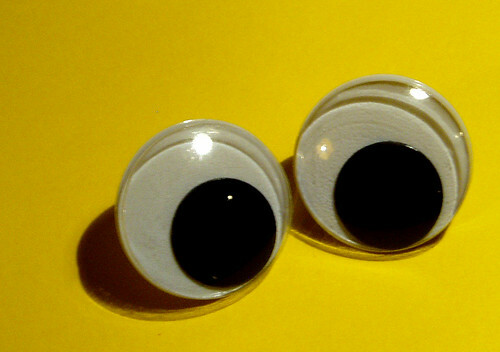 Are you googly for googly eyes? P.S. I linked this post up at TaterTots and Jello’s Weekend Wrapup Party! This is repost from a couple of years ago that I wanted to reshare! I just love googly eyes and the instant personality they give! Enjoy! I had so many ideas that I wanted to do today. Just in my ride home, I came up with ten terrorific possibilities, but in the mind of swell, you have to reel it in and stay focused. Knowing that I wanted to do a lot of ideas, I stuck to a theme and stayed within the lines of all things googly eyes. You may remember the googly eye choker that I did a few months back that was really well received. Well, I wanted to expand this idea and come up with some really fun and easy crafts that anyone can do…I’m going to share the basic idea of how to achieve these looks, but if you want more info, please e-mail me at swelldesigner@yahoo.com and I’ll give you more details…OK, on with the show! To get the googly eye frame above, paint a $1 frame (I got mine at Michaels) with acrylic paint. 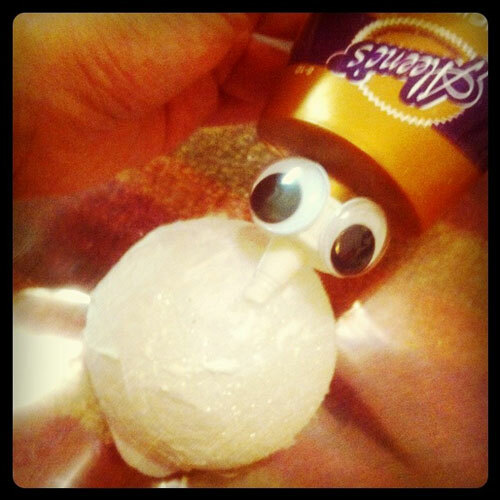 Then use a craft glue like Liquid Fusion® to glue various sizes of googly eyes onto the frame. Print out a picture to fit the frame and insert it into the opening of the frame (If you notice, I used the Terrorific Tuesday mascot, my black cat Pixie). Glue googly eyes to the picture and hang. 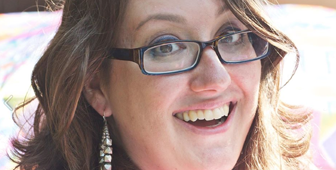 I got the idea to put googly eyes onto the picture from one of Jennifer Perkin’s (the Naughty Secretary) photos. Click here to see that creation. 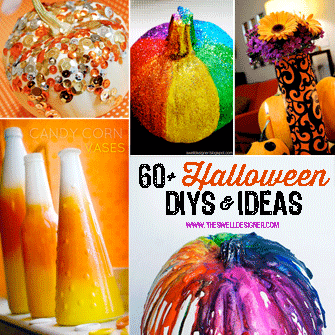 I wanted to create a fun accessory that would be something a little different for Halloween. I painted this headband form and sealed it, but you can also wrap it with ribbon and glue gun it if you’d rather have that look. On my version, I actually wrapped Rainbow Tape around it, but you can also wrap ribbon if you want. On a large button, I placed a medium sized googly eye in the center using Liquid Fusion. 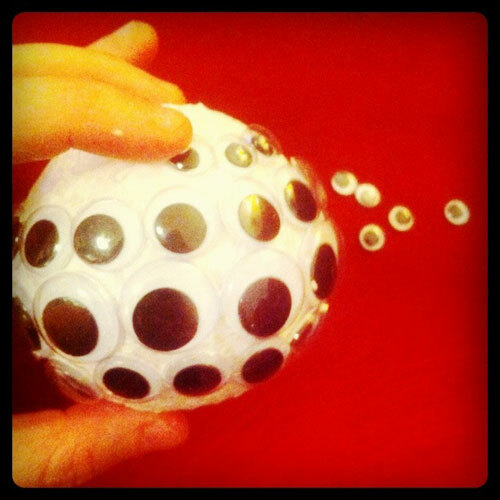 I then glued several smaller googly eyes around it to complete the look. I glued it off to one side of the headband and voila, I have a super cute googly eyed flower headband! I purchased really small faux pumpkins at Wal-mart for a dollar. I glued on googly eyes in two different sizes with Liquid Fusion (yes, it was intentional-ha ha) Using a liner brush, I brushed on the features with acrylic paint in black (you could also use a permanent marker if you didn’t have paint) I added in additional hair and eyebrows and put on a bow for a completed look. This is really quick craft especially for little hands. I actually created this last year, but I thought someone would perhaps enjoy it for Halloween accessorizing. I painted a 1.5″ wooden disk with acrylics, then used E-6000 to adhere the mini googly eyes on it. I left a small hole at top for drilling. I then mixed up some Envirotex Lite to coat the charm following packaging directions (lay your charm on wax paper for this process – trust me on this one). Let dry for several days, then use small drill to drill into resin and disk. Thread jewelry cord through disk and it’s ready to wear! All eyes will be on you! Another fun idea to try is this choker. I cut a piece of felt about 1.5″ inch wide and the length to be shorter than my neck diameter. I then added ribbon clinch clasps at both ends. Using jump rings and chain, I made a final closure at the end. I then used Fabric Fusion Glue to adhere the googly eyes to the felt. I think this has a whimsical gothic feel to it. This could also be made into a wrist cuff or headband if you are so inspired. You simply adhere large googly eyes to earring post blanks and let dry. You can also add the googly eye to a ring blank or brooch pin for a wearable conversation starter! On a final note, if you go to Flickr and type in googly you can see all kinds of cool and creative pictures and inspiration. It is really worth a look. And if you notice at the top of the matching results, you can change it to be most relevant, most recent or most interesting. Most interesting is the way to go in this search! 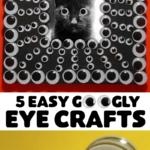 Hope you had fun with the googly eye crafts. I know I did. Since I will be gone for this week and next, I thought I would still compile some fun things to inspire you. I plan on sharing a craft and photo that I’ve created and taken…hopefully to inspire you as well as a link to a fun site you should check out. Enjoy! 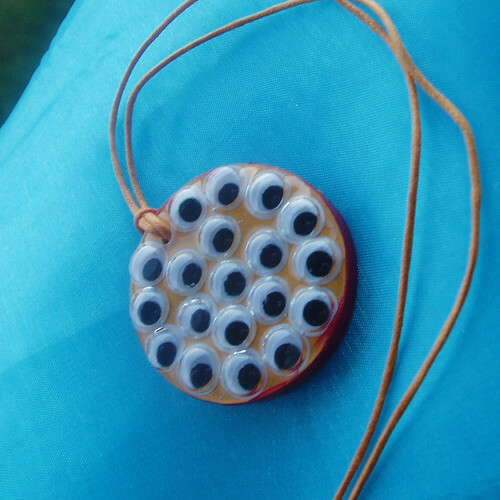 A fun googly eye pendant necklace I made a few years back! 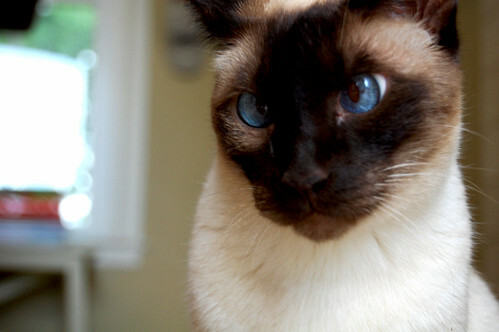 I think this cat’s cross eyes might make you laugh. 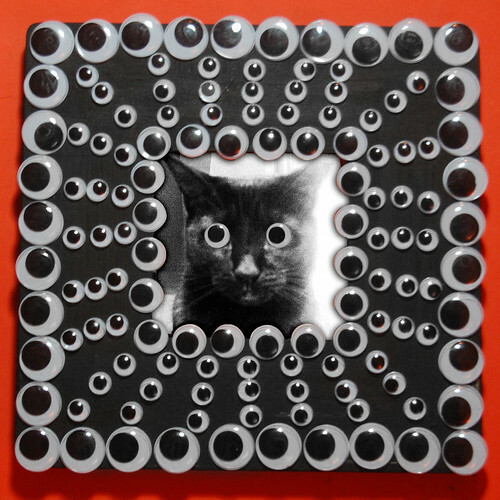 If you want a laugh or a boost to the day, check out these funny googly eye images in the WNYC’s Amy Sedaris Craft Challenge pool. To get this look, paint a $1 frame (I got mine at Michaels) with DecoArt Americana Acrylic paint. 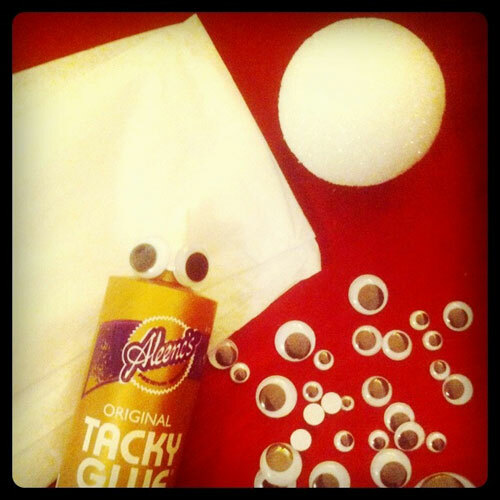 Then use a craft glue like Krazy Glue or E-6000 to glue various sizes of googly eyes onto the frame. Print out a picture to fit the frame and insert it into the opening of the frame (If you notice, I used the Terrorific Tuesday mascot, my black cat Pixie). Glue googly eyes to the picture and hang. I got the idea to put googly eyes onto the picture from one of Jennifer Perkin’s (the Naughty Secretary) photos. Click here to see that creation. 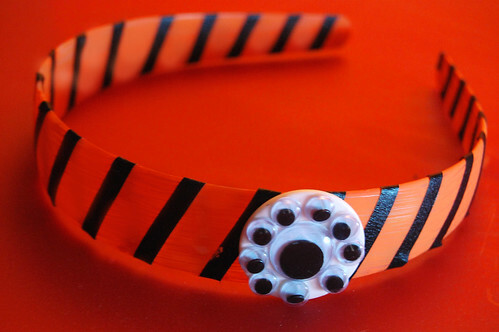 I wanted to create a fun accessory that would be something a little different for Halloween. I painted this headband form and sealed it, but you can also wrap it with ribbon and glue gun it if you’d rather have that look. On my version, I actually wrapped Rainbow Tape around it, but you can also wrap ribbon if you want. On a large button, I placed a medium sized googly eye in the center using Krazy Glue. I then glued several smaller googly eyes around it to complete the look. I glued it off to one side of the headband and voila, I have a super cute googly eyed flower headband! 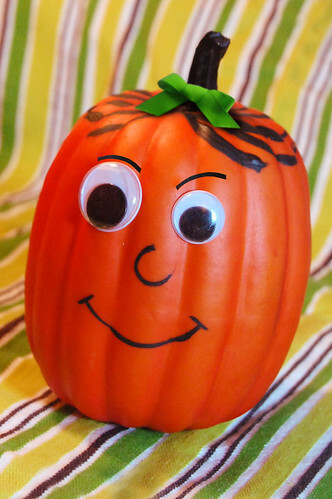 I purchased really small faux pumpkins at Wal-mart for a dollar. I glued on googly eyes in two different sizes with Krazy Glue (yes, it was intentional-ha ha) Using a liner brush, I brushed on the features with Americana Acrylic paint in black (you could also use a permanent marker if you didn’t have paint) I added in additional hair and eyebrows and put on a bow for a completed look. This is really quick craft especially for little hands. I actually created this last year, but I thought someone would perhaps enjoy it for Halloween accessorizing. I painted a 1.5″ wooden disk with Americana Acrylics, then used E-6000 to adhere the mini googly eyes on it. I left a small hole at top for drilling. I then mixed up some Envirotex Lite to coat the charm following packaging directions (lay your charm on wax paper for this process – trust me on this one). Let dry for several days, then use small drill to drill into resin and disk. Thread jewelry cord through disk and it’s ready to wear! All eyes will be on you! Another fun idea to try is this choker. I cut a piece of felt about 1.5″ inch wide and the length to be shorter than my neck diameter. I then added ribbon clinch clasps at both ends. Using jump rings and chain, I made a final closure at the end. I then used super duper fabric glue to adhere the googly eyes to the felt. I think this has a whimsical gothic feel to it. This could also be made into a wrist cuff or headband if you are so inspired. 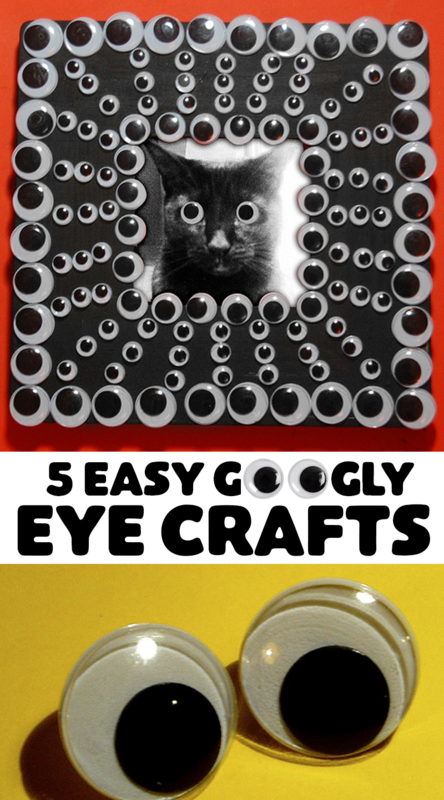 Hope you had fun with the googly eye crafts. I know I did. Check back tomorrow! I’ll post the other projects created for Terrorific Tuesday then! All content/photos copyright, © Alexa L. Westerfield, 2008.